we stayed in a gold apartment which was clean,spacious and right next to the gold carpark. we stayed halfboard so ate in the yatch club which was nice and such alot of choice to eat. every time you visit the yatch club the girl at the desk gave you some hand gel to kill any germs before you go in and get your food which is good to see. staff were all pleasent and love the kids. Great! Had a standard Half Board room. It was small but clean, thats all that matters, we were only in it to sleep! Great entertainment, great kids facilities. i have a 5 year old so if shes happy i, happy, I dont go looking for faults! This was the first time we have visited Butlins. We stayed there Monday-Friday and the whole holiday was excellent. we stayed in the gold apartments, which we found were clean, a good size and were worth paying the extra for. The food was very good as most of it was self-service so you could have as much as you liked and there was good choice for kids and adults. The entertainment was first class. There is everything you need in the Skyline and the shows in Centre Stage were very good. My youngest son (1 yr) won a competition and part of the prize was a 4night break to Butlins in silver accommodation (self catering). Having never been to butlins, and this was a 'free' holiday, we paid to upgrade to deluxe DBB. We arrived at the resort, got keys and found what looked to be the right accommodation - rather untended (rather than rundown) low buildings, with a bulk lot of double glazed porch things on the front. Ok - so not too worried here, thought there was another entrance, this was the only one entrance to the accommodation - the porch thing. Which opened straight into what I loosely call a lounge. We stayed here last weekend. We booked a Silver Apartment. We had 3 bedrooms, 1 was a double and 2 with 2 singles. The double I think had a wardrobe built in, 2 bedside cabinets and a mirror. The other 2 had hanging space and 2 shelves and 1 bedside cabinet with 2 draws. The electric point in the single bedded rooms were hidden behind the bedside cabinet. The beds were comfortable enough, with 1 pillow on each bed. (I took an extra one each for me and hubby) The duvets and bedding were clean. There wasn't a mirror in 2 of the bedrooms so my brother unscrewed the one in the hallway and we shared that one. The living room/ kitchen had a 3 seater and a 2 seater leather settee and a normal size tv. A table with 6 beech style chairs. An electric cooker, microwave and toaster. Cutlery and crockery for 6. There were pans but we didn't have a frying pan (it was listed on the list inside the cupboard) but I'm sure they'd give us one if we went to the reception to ask. There was a pack in the kitchen with a tea towel, tiny bottle of washing up liquid, a cloth and a scourer pad thingy. There was also a full size ironing board (no iron) and a small clothes horse. To get into the rooms they now use credit card style keys. We were issued with 2 and I asked for another and got one no problem. It was very, very busy there with lots of hen and stag parties. It was an adult weekend. There were some sights to be seen!! The entertainment was dance music and was ok if you like that music. The Venga boys were there Friday night and Cain Dingle (Emmerdale) did a DJ slot on Friday night as well. I think the resort looks a lot better than it has in the past. On the way home after a night out we passed lots of discarded bottle and cans and rubbish, but this was nowhere to be seen the next day, so the cleaning teams are working hard. Even though we were situated at the back it's not really that far to the entertainment (the weather was dry all weekend so we were lucky) There is a small shop just behind where we were. It was also quite quiet there in the accomodation. We ate in the Hairy Dog pub which is in the town. Menu was good but we were dissappointed with service. I had Carbonara which to me was way too creamy. Brother and sis-in-law had to wait ages for theirs but it was lovely. Our other friend didn't even get hers (they forgot!!) but her hubby had a lovely meal. We never book anything less than silver, the standards are just that, bog standard! We stayed in 2 silver plus bungalows, in each bungalow there were 3 bedrooms, 1 double which was a huge room with a large mirror, wardrobe and plenty of room, one twin room, and one bedroom with bunk beds and a single bed in. The rooms were so damp we had a frog hopping around the living room. I had to clean the bathroom myself before I would let anyone use it, it was quite grimy. In the double bedroom there was a large damp batch on the ceiling in the corner. The windows are not double glazed and rattle slightly with the wind. The key cards only worked when they wanted to so we got caught out in the rain trying to unlock the doors. We went to Butlins on a 4 night break. It's 18 years since we last went there and it has changed completely - other than the accommodation which is still very basic, shabby and below standard. There is supposed to be maid service who make the beds and empty the bins etc but the maid only made the bed once in the 4 days. Lights didn't work and there was only one tiny pillow on each bed, so we had to ask for more. TV had really bad picture. Butlins should be totally ashamed of their standards of accomadation. We booked a Silver Room with two bedrooms and we expected some degree of comfort with it not being budget. Or so we thought. The rooms stink of damp and the 'furniture' is very old. The bedding felt damp to the touch too. We have had to wash the clothes that were not used as they came home smelling of damp after hanging in the wardrobes. Our bathroom had excrement smeared over the tiles by the toilet and the back of the bathroom door and the pokey little shower was covered in mould. Never again will we pay good money to stay at Butlins. However, the rest of the site is very clean and litter free with the gardens very well kept. The food was ASDA cafe at best. You had to beg for more than one sausage at breakfast or more than one slice of beef/turkey/chicken at dinner. You do get soft drinks included in the half board option though which was a bonus. 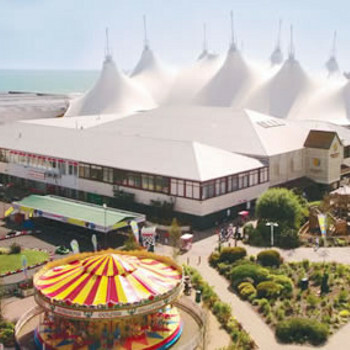 Butlins Minhead is located right opposite Minehead beach, which is large and sandy. The water is very warm too. It would have been nice to have been able to have hired some chairs and winbreakers but there was no one there to hire them from. The staff are all eastern european which I found very strange. They are very un-smiling and often get in your way. YOU have to move for them and in the restaurant, when you are trying to carry a couple of trays of food, that can be very annoying. Very little english is spoken by them. The Redcoats though are all British. Some tried very very hard to keep us entertained, but some felt they were only there to tell the kids off. "Don't sit there, Don't touch that, Don't do that..." is all we heard from some of them as they laid in to the kids. They need to understand that kids get exited and are not always doing things maliciously. My two were man-handled in the queue for a photo with a band called Pop Mania as they dared to go up for a second photo each afetr having a joint one taken the first time. I was not happy and told her so too! One thing Butlins know how to do is keep you entertained. The evening shows were fantastic with performances from Brenda and Nicolas from the X-Factor, Shaun Williamson and Nicholas Bailey (Barry and Dr Trueman from Eastenders) and a great Pantomine from Joe Pasquale. We were all very happy with the entertainment. However, very little is free at Butlins anymore. They were even charging for a 5 minute jump on a bouncy castle and the Trampolines which I felt was a touch miserly! The pools are free though with some wicked flumes to ride. Based on the previous reports we were not looking forward to going. We were pleasantly surprised. We paid for Gold accommodation and judging from the other comments I think this must have been a good move. Accommodation was clean and roomy. We were near all facilities but it wans't too noisy (except for the seagulls and I don't think you can blame Butlins for that). The other accommodation did look a bit prison campish. The food was fantastic. Due to being Gold we ate in the Yacht club, you had the same table every day (which was good for our young sons)and the choice and quality was amazing for dinner and breakfast. I would definitely recommend anyone to upgrade to this as the other food halls didn't look anywhere near as nice. We went to the beach a few times but didn't really like the look of the sea and things that were washed up but our boys loved playing in the sand. I did get a bit tired of the amusements in the skyline so we didn't spend a lot of time in there. Our boys had their best holiday yet and we will definitely go back again, probably for 4 days rather than a week. We found the staff to be fine and if we had a problem they sorted it out quickly.